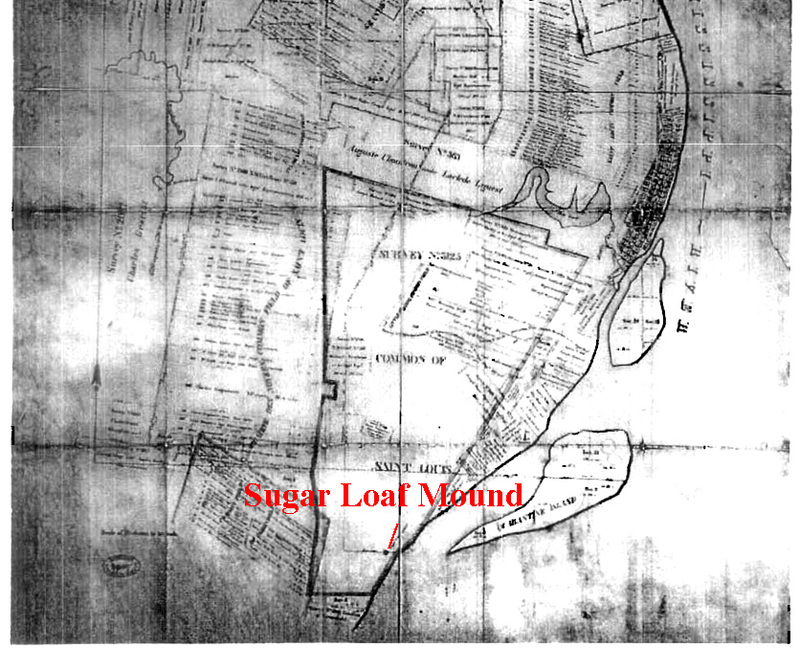 One of the most significant archaeological sites in the St. Louis area is Sugar Loaf Mound (23SL9); it situated on a second terrace above the Mississippi River in downtown St. Louis. 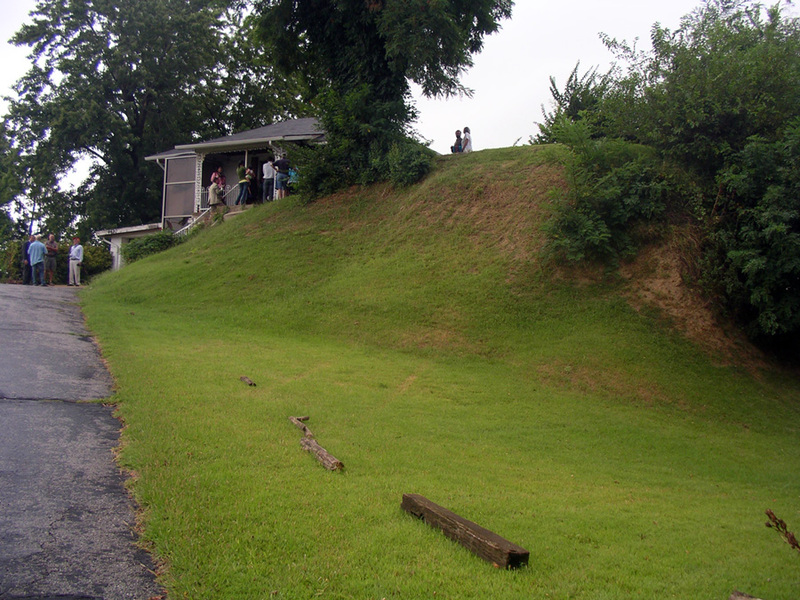 It is the only mound in the downtown area that escaped destruction during the 19th century. 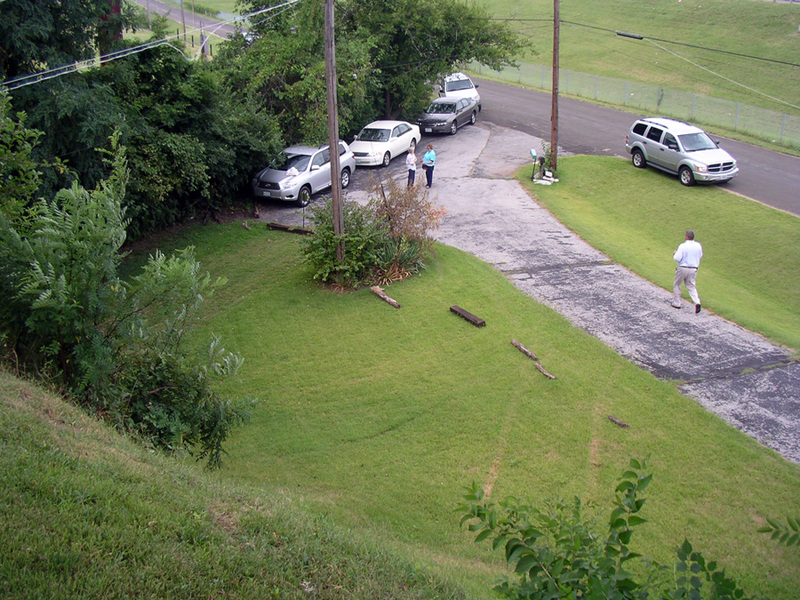 The site was purchased from a private landowner by the Osage Nation during August of 2009. The mound can be seen from the North-bound lanes of Interstate - 55, but it is not easily reached and is not open to the public at this time. View of the mound looking towards the northeast. An article calling for the preservation of the Sugar Loaf Mound appeared in the March 30, 1932 issue of the Globe-Democrat; the article described the mound as conical in shape and 40 feet (12.2 meters) in height. 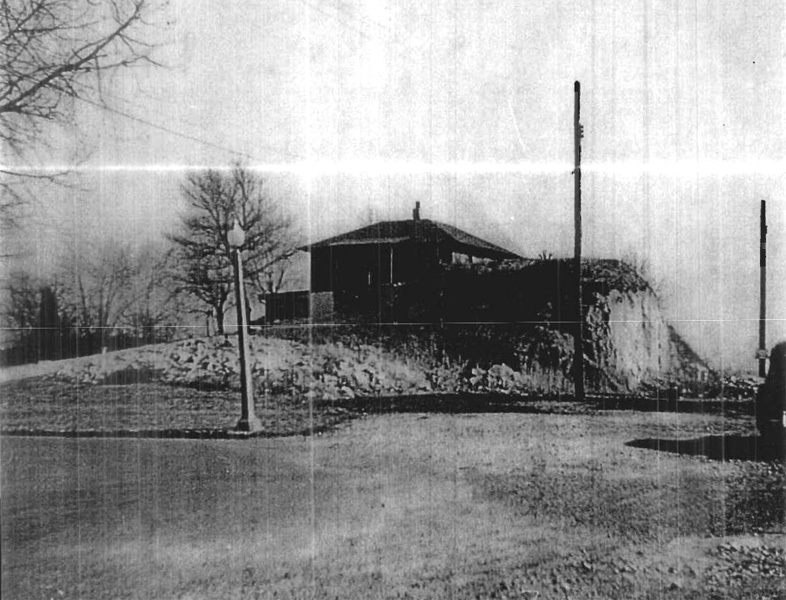 Part of the south apron of the mound was cut away between 1932 and 1940 by the Hoffman Quarry; an article (3 October 1940) concerning the mound was published by the Post-Dispatch and shows the damage. View from the top of the mound looking towards the southwest. Sugar Loaf Mound was documented for the Archaeological Survey of Missouri by Leonard Blake in 1950. The site was nominated to the National Register of Historic Places in 1981 by Dr. Robert P. Wiegers on behalf of the Missouri Archaeological Society. Wiegers reported the mound's dimensions in 1981 as 8 meters high (21.86 ft.) with surface dimensions of 42 meters (141 feet) North - South and 32 meters (109 feet) East - West along the south face; he reported that at least 1.5 meters (5 feet) of landfill had been spread around the base of the mound. 1812 map by Mosberger showing the location of Sugar Loaf mound opposite of the south tip of Quarantine Island; the map was scanned and enhanced from the National Register nomination form prepared by Wiegers in 1981. 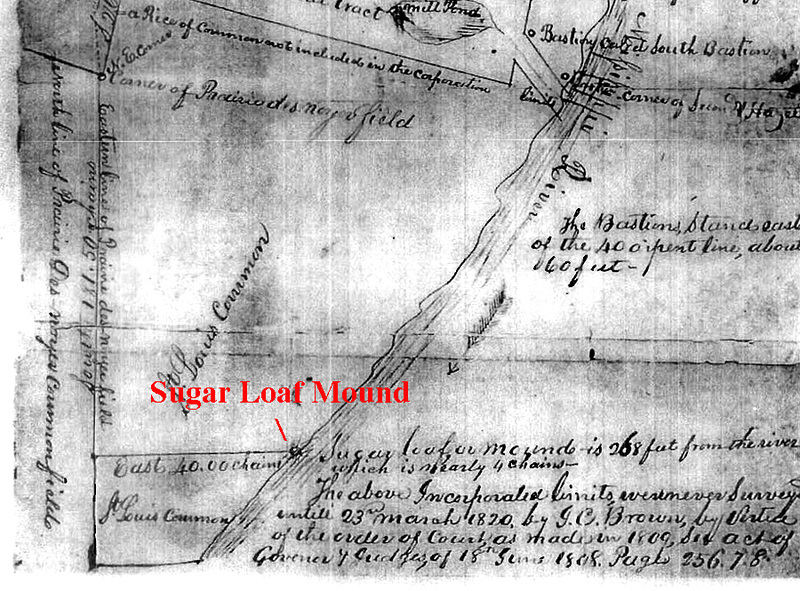 1820 plat prepared by J. C. Brown showing Sugar Loaf Mound and noting that "Sugar Loaf or Mound is 268 feet from the Mississippi River." The map was scanned and enhanced from the National Register nomination form prepared by Wiegers in 1981. Photograph of Sugar Loaf Mound (facing east) taken by Leonard Blake in 1950. The photograph was scanned and enhanced from the National Register nomination form prepared by Wiegers in 1981. 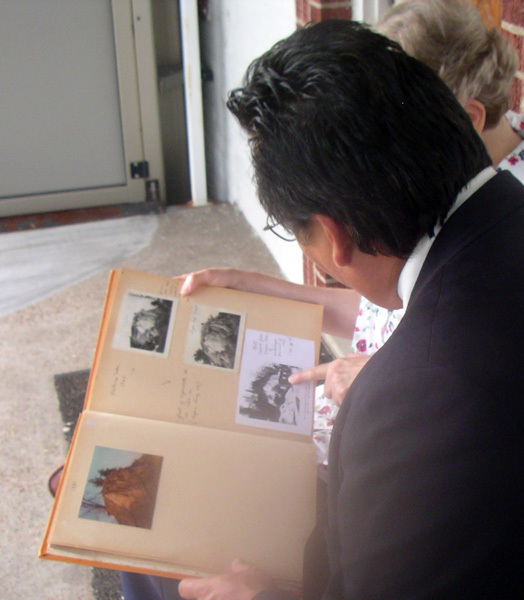 Chief James Roan Gray of the Osage Nation looks at a scrapbook of photographs and articles about Sugar Loaf mound with Ms. Joan Heckenberg. Thanks to Dr. Leonard Blake, Dr. Robert P. Wiegers and Neathery B. Fuller who discussed Sugar Loaf Mound with me during the 1980s. Many thanks to Kathy Waltz from the office of Congressman Russ Carnahan for the invitation to attend the Osage blessing ceremony in August of 2009. Special thanks to Chief James Roan Gray and Elder Charles H. Red Corn (Tzishuwashtahgi/Peace clan) for taking time to talk with me ahead of the blessing ceremony. Many smiles to Ettus Hiatt for proofreading my webpages.